Hope you’re all doing really well? I should say #HappyHalloween, but I'm coming at you with some festivities today ha ha! I know we’re still a little while away from Christmas, but it definitely does come around quick! I’m sure I’m not the only one who has engaged in some frantic last minute shopping! I’ve decided to start my 2015 Christmas Gift Guide called ‘Give The Gift Of Relaxation’ It will be a three part series and will feature some fantastic products perfect for adding a little relaxation into your life or whoever is lucky enough to receive them as gifts. I’m going to start off this series with a little NEOM love and you know I love me some NEOM! – All products featured in the gift guide will be products that I truly believe in and know will make fantastic gifts this Christmas. I hope you enjoy this review lovelies and I would love to hear from you in the comments section below. You can also use my Social Icons to the right hand side if you would like to get in contact a little quicker or if you have any general questions for me! Who doesn’t love a candle? They’re relaxing, smell great and are the best way to restore inner calm. 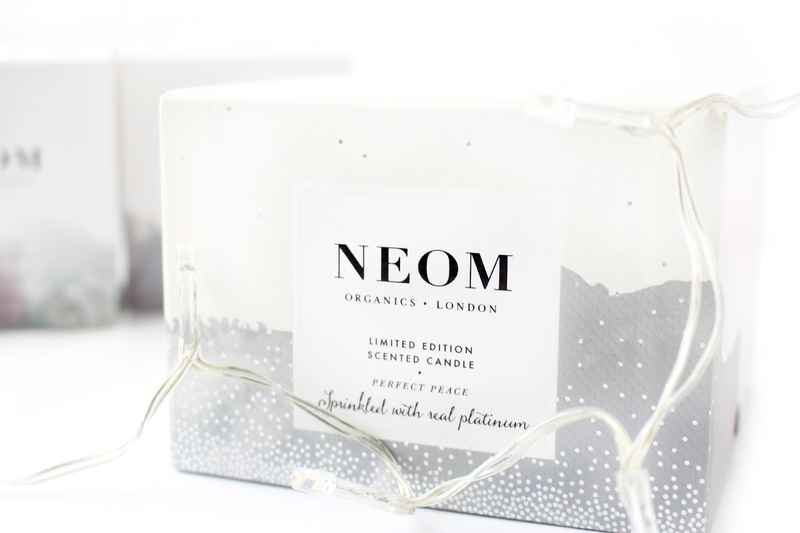 NEOM Organics are a favourite of mine and I have purchased their candles and other products for family, friends and myself many times (especially at Christmas) Each year NEOM introduce a few festive additions to their already impressive collection that truly make the perfect gift/treat. The Perfect Peace Candle contains a special vegetable wax blend plus Pine Oil, Myrrh Oil, Lime Peel Oil and 22 additional pure essential oils to promote ultimate relaxation and good spirits. 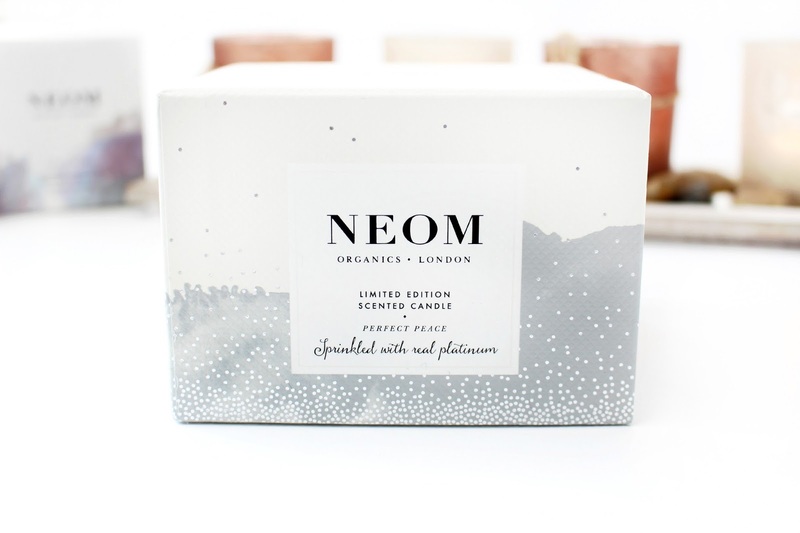 I find at Christmas there are two scents I love and they’re either the kind of scents that uplift you (Like this one) Or the more warming scents like NEOM’s ‘Make AWish’. However, with a busy work schedule the blend of pine, myrrh and lime peel are such an uplifting combination and make me feel like I’m on a lovely winter’s Walk in the woodlands. 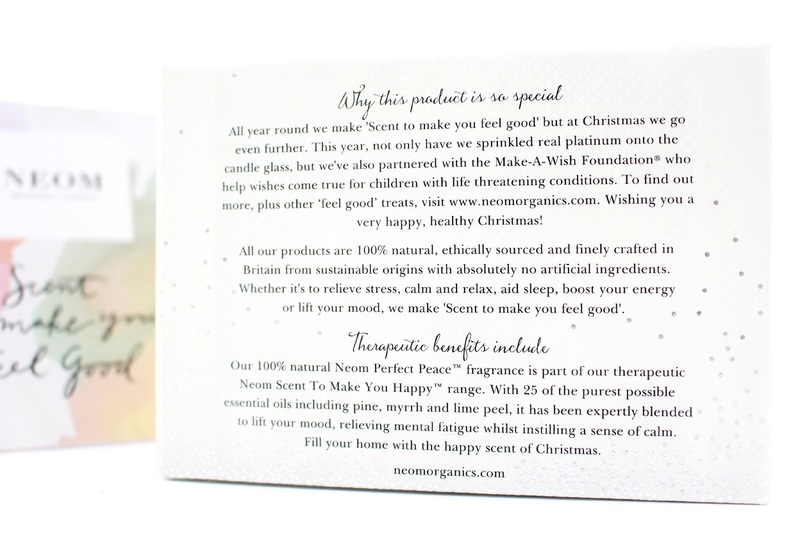 All NEOM products that I have tried have been truly fantastic, but at Christmas they go the extra mile and this year NEOM have sprinkled real platinum onto the candle glass and have also partnered with Make-A-Wish UK who grant the magical wishes to enrich the lives of children and young people fighting life threatening conditions. In order to get the best out of your candle burn it for a minimum of 2 hours and a maximum of 4, which helps to ensure the wax burns evenly. Within 10 minutes of lighting the candle my bedroom fills with the most beautiful uplifting scent, which makes me feel fantastic whatever time of day! Plus the candle has an impressive burn time of 50 hours. I briefly mentioned the packaging above, but I have to say how stunning it is and of course great packaging is always a plus, especially when you are thinking of gifting to a special someone. 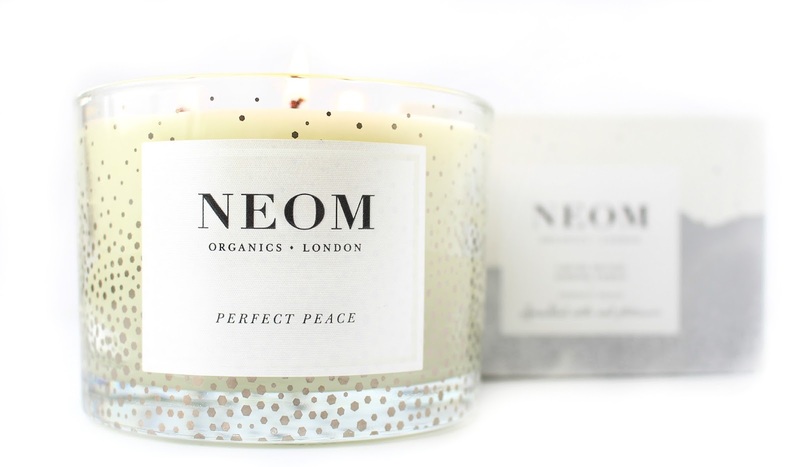 The candle is quite expensive at £49.95 but please believe me when I say that NEOM products are worth it if you’re in the market for a little self-indulgence or to give as a gift. Everything from the packaging, customer experience, quality and of course the product is just perfect. You can also Save 15% by signing up to their newsletter, which may I add is also great! 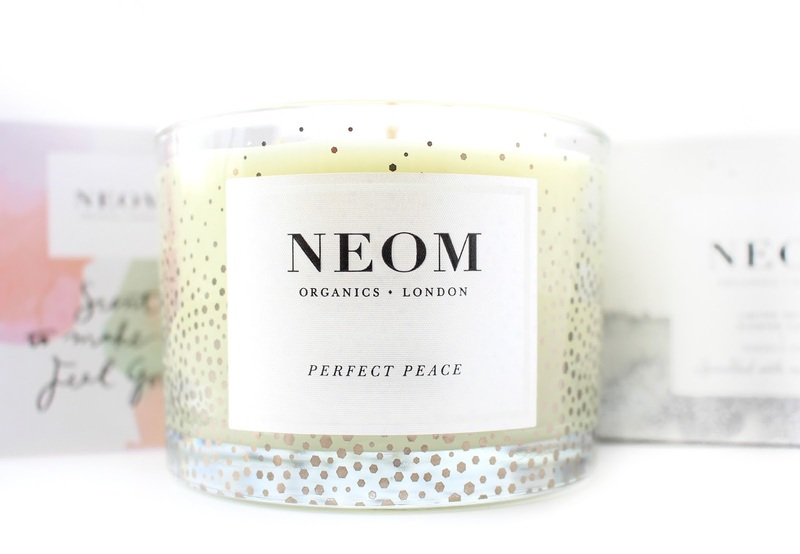 – Overall, Perfect Peace would be the most beautiful gift to give to someone who perhaps needs the relaxation of a candle, but the uplifting scent and opulence that the Perfect Peace Candle offers! I will also be purchasing Christmas Wish to show my support to the Make A Wish foundation. I hope you've enjoyed the first installment of my 'Give The Gift Of Relaxation' series and I can't wait to bring you my next gift! I would love to hear your thoughts below - Would you love to give/recieve this gorgeous candle this Christmas? Snap, Im just like Vicky. I've never tried neom but they look so luxurious I would love to!